The maiden flight of the world's longest aircraft has begun - after a previous attempt was abandoned at the last minute. 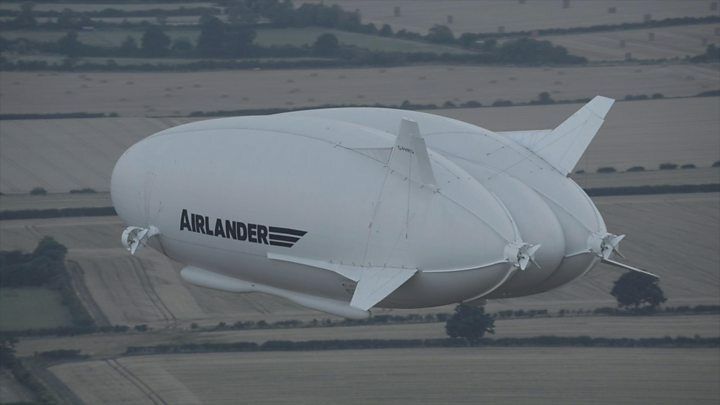 The Airlander 10 - which is part plane and part airship - took off from Cardington Airfield in Bedfordshire. Its original test flight on Sunday was postponed, but it finally left the ground at 19:40 BST. The £25m aircraft measures 302ft (92m) long and is about 50ft (15m) longer than the biggest passenger jets. Sunday's attempt was dropped because of a "technical issue" which could not be resolved in time for a daylight flight. Media captionHelicopter footage of the maiden flight of the world's longest aircraft. The airship is not allowed to fly at night during the test stage. Christened the Martha Gwyn, the aircraft was first developed for the US government as a surveillance aircraft but the project was shelved amid defence cutbacks. The company hopes to be building 10 Airlanders a year by 2021. The Airlander 10 was launched from Cardington Sheds, a Grade II-listed relic of World War One which housed airships in the 1920s.